Science journals must have the laziest, most rent-seeking business model in the world: Capture the results of publically-funded research from scientists for free, have other scientists review and edit those results for free, then publish those results for an extortionate fee. There’s no doubt that this model is doomed. 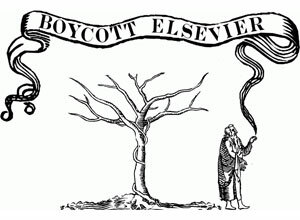 The boycott targets Elsevier, the publisher of popular journals like Cell and The Lancet, for its aggressive business practices, but opposition was electrified by Elsevier’s backing of a Congressional bill titled the Research Works Act (RWA). Though lesser known than the other high-profile, privacy-related bills SOPA and PIPA, the act was slated to reverse the Open Access Policy enacted by the National Institutes of Health (NIH) in 2008 that granted the public free access to any article derived from NIH-funded research. The constant pressure to privatise the good, and socialize the risk is endemic. When someone owns a means of production that is more efficient, it can eliminate a large number of jobs, and he stands to profit handsomely from the money he saves. In other words, it’s not so much that American jobs are going overseas; those who own efficient means of production are now pocketing the money that they used to spend on hiring people.